What was it like working with Kevin Smith as the director of the pilot? It was so great. I thought it was really genius on Tara and Michelle’s part to bring Kevin in, and have him direct the pilot episode, because he totally understood the ideology and the comedic timing of the show, and just the energy and what it needed. I can speak for myself: Ben was a character that the girls were still trying to figure out; how he played along with the guys. Kevin was very sensitive to that and tried to help as much as he could, in terms of trying to find where Ben lived on the show. He was totally perfect in terms of someone who would direct our pilot episode, and he was pretty genius at it too. I would love to see him do some more TV. Ben always getting himself hurt – was that something that was created for the pilot as you all were filming, or was that in the script? That kind of evolved into the script. It was kind of a way to show how Ben is very gung ho and wanting to help the guys, but isn’t exactly savvy at keeping himself out of harm’s way. But it does show that he is very committed and willing to help at whatever cost. That kind of evolved. As every soul emerged or demon we had to capture, you just saw it more and more. If the show had continued, what would have happened between Ben and Nina? That’s a good question. I don’t know. That’s a question for Tara and Michelle. I’m interested to see, because as you saw in the first season, there are other other admirers that Ben had, and those fizzled away. I was like “Okay, so they’re not coming back?” And then there was a new demon [Nina]. I saw a connection there; I saw something happening there. But I don’t know. I think what’s great about the show is that the girls were at hand just creating a world where these guys just kind of were affected by it, and were coming together and wanting to help each other, and how that relates to their lives. It made sense for Ben to fall in love with a demon, because he was the most sensitive of the group. He was a person who wanted to help, and he was looking for that. So I think it made sense, and it was completely hilarious, by the way. I think everyone was vocal in saying that was everyone’s favorite storyline of the show, which is humbling, because where do you find that on TV nowadays? Which character on the series do you think was the most afraid of Ben’s grandmother? Ohh, that’s a good question. I think it was Sock. Then again, Sock was pretty fearless at times, as well. I would say Sock, though. Was there a particular favorite moment for you in doing the series? Working with Lupe Ontiveros, who passed on. She played my grnadmother on the show. She was amazing. She’s a legend in her own right; the work that she’s done. I cherish those moments, working with her. That was definitely a big moment. Another moment would be when Ben lost his eyebrows; that was pretty funny. There are so many moments on the show that I thought were great. Working with Lucy Davis, who is an original cast member from The Office. She is completely hilarious. It was just so much fun on set with her. Working with Ken Marino and Michael Ian Black was a blast. Those guys are just comedic geniuses, and what they brought to their characters was just nothing short of amazing. Can you talk about your music career with Realm Reality? That’s a moniker that was given to me when I was 18. I’ve been doing music since I was 18. I have a LP coming out in September, and I’ve been working with a lot of great people. You can look out for that. Go to realmreality.com for all the latest in the music stuff. I read that you appeared in a Lady Gaga video as Jesus? What would Reaper’s Devil have made of that? I don’t know. I’m glad it wasn’t brought up on the show. I didn’t want the Devil to be upset. I’m sure the Devil would know, anyway. Lady Gaga, Jesus… Lady Gaga called my people and said she would like me to play Jesus, and I was totally taken aback. I didn’t even know she knew who I was. It turns out, she’s a fan. It was really humbling, and I had a great time. I worked with Norman Reedus of The Walking Dead fame. 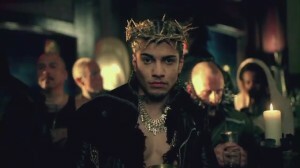 He played Judas in the video as well. We had a great time. It was pretty fun. 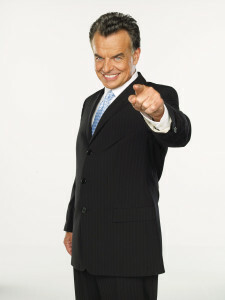 Speaking of the Devil, looking at photos from the reunion… did Ray Wise stay in character in between takes? [Laughs] One has to wonder. We simply called Ray a “handsome devil.” It just fits so well with him. He’s just so suave. It’s so easy for him. He definitely talks in detail about playing the Devil and how much he had fun with it, and how that’s one of his favorite characters to this day. What made Reaper unique as a series, in your mind? I think the idea that it’s a one hour comedy, mixed in with a little bit of drama, and not taking itself seriously… yes, we had special effects. They weren’t the greatest special effects, but it was like a bowl with a bunch of ingredients thrown in. It was like a buddy comedy. Tyler actually mentioned this: There aren’t any hour comedies of that nature on TV now. So, the fact that you have a sort of sci-fi comedy mixed with three guys, for one hour on a show where it’s just a bunch of laughs and fun, and just a quirky attitude toward everything… I think that’s what made it rare, and I think that’s what made it special. FEARnet is going to be showing the original series in early June. Is there a particular episode that stands out to you, that people really need to tune in to? They’re all so good, it’s hard to choose. Oh, man. I guess the first episode. It sets the tone for everything. I think you’d be pretty lost if you didn’t watch the first episode. I know some friends of mine were like “hey, I want to watch the show, but I don’t know what’s going on, and I’m confused.” So, I always send them back to the first episode. Figure everything out, learn the ideology, get it all down, and then you can jump back in whenever you want. Is there a particular Ben episode that you’d recommend to somebody who is familiar with the show? I guess the episode with my grandmother. That’s a good one. That one, or the one with me and the rabbit. Ben loves rabbits and animals, so that’s totally up Ben’s alley. You’re doing a new project called East Willy B. What can you tell me about that? It’s a comedy that is actually based on the neighborhood I grew up in, Bushwick, Brooklyn. It’s a comedy about the gentrification of my neighborhood, and how it’s changing. We shot six episodes. I play a character, a Reggaeton artist, who’s actually related to the lead character, and I come back to the neighborhood. I’m pretty egotistical, but at the same time, there’s still a lot of heart and a love to the story. I think people would love it. It’s just a really cool, funny take… kind of like a Cheers type of thing, where you have everyone in the neighborhood bar, and their feelings on what’s going on in the neighborhood. Check it out! It’s at EastWillyB.com. If someone came to you and said “let’s do a third season of Reaper,” would you do it? Oh, without a doubt. Absolutely. I’ve said this before: Playing Ben was the most fun I’ve had, and the kind of character that I really get a chance to play. Kudos to Michelle and Tara; they’ve given me the opportunity to play Ben. So, if they were back at it, I’m in. Are there any final words you wanted to get out there to the fans? Thank you. Thank you for watching the show. Thank you for showing so much support and love. Thank you to those die-hards out there like ReaperDMV, all those guys who have their once a week watch of Reaper… all that stuff just means a lot. It just shows that you guys care, and that everything we did, didn’t go in vain. We had a great time doing it, and we’re happy that people still watch it, so thank you.